It's important to remember that the research process doesn't always go smoothly. You may have to go back and refine or change your topic or search strategies as you work. You might discover that your ideas about a topic were wrong. You might end up finding the resources you selected aren't appropriate and have to try again. That's ok! 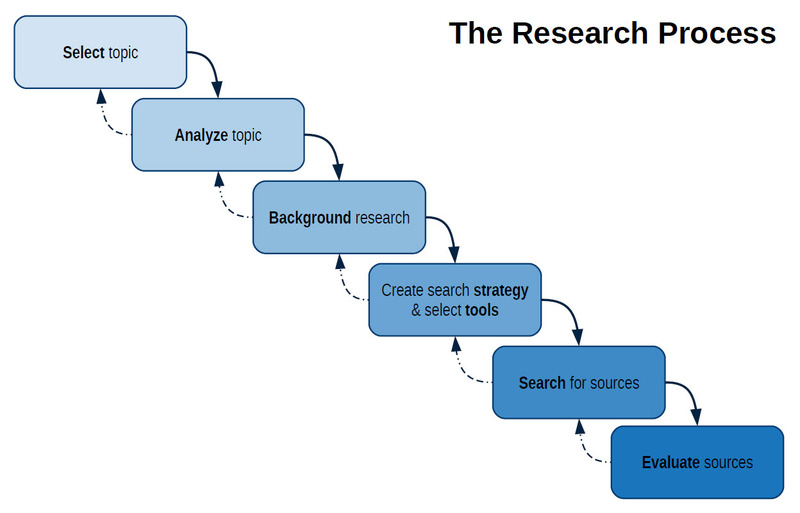 Those are all parts of the research process. Before you start your research you might want to get a reference manager like Zotero or Mendeley. Both are free programs that store information about the books, journal articles, websites, and other information sources you'll use. With Zotero or Mendeley, you can annotate your sources, create citations in any style, and create bibliographies quickly and easily. Next, make some claims about your topic by adding verbs. These might not end up being true, and that's ok.
Is reality television more than entertainment? What are the most likely consequences of human cloning? Can Ahab be understood as heroic? Once you're ready to start searching, it's time to create a search strategy. Being thoughtful at this stage will save you time in the future. Make a list of keywords that have to do with your subject. Be sure to think about other ways to phrase your topic. The specific words you search for matter. If you're not seeing enough results, or not seeing the right results, you might have better luck searching for synonyms or related words. This part can be challenging if you don't know much about your topic yet. If you're having trouble thinking of words or phrases related to your topic, try doing some basic background research. Look up your topic in an encyclopedia (or even Wikipedia) and write down important words and phrases. If your reference source lists citations, you'll probably want to follow them up. Sources like encyclopedias are a good way to start your research, but you want to use them as a tool to get to other information, not as your final research. Once you've got a topic and a strategy, you need to decide where to search for information. Some tools are better for finding specific types of information, so think about what type of information you want. Our Library Search finds books, multimedia, and articles available from the library, either online or in the building. It can be a good place to start your research, but you'll get a lot of results! Remember that you can use the limiters on the right side of any results screen to narrow down your search. 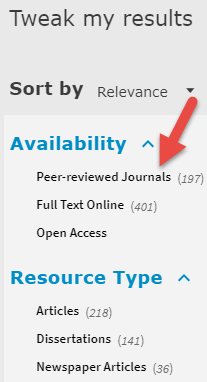 For example, if you know you want a peer-reviewed journal article, limit your search to "Peer-reviewed journals". You can also limit your results by resource type (books, articles, videos, and more), creation date, and other useful criteria. Be sure to click "See more" if you don't see the resource type you're looking for. General OneFile contains citations and some full-text of newspaper, magazine, and journal articles. Subjects covered include humanities, education, business, science, art, and more. ProQuest Research Library contains peer-reviewed journal articles, newspaper articles, magazine articles, and trade publications. Subjects covered include art, business, health and medicine, history, law, literature, psychology, natural sciences, social sciences, engineering, and women's studies. If you're looking for peer-reviewed articles or some specialized resources (datasets, statistics, etc) you'll probably want to be in a subject-specific database. As you learn more about a subject, you'll start to become familiar with related databases. If you're not sure which to use, you can check out our Subject Guides for some help.